I am back from my "gone fishing," trip, which was really traveling through northern Italy, including a too brief but extremely delicious stop in Bologna. Bologna is a fascinating place, with a history that is progressive beyond progressive (the first to free the feudal serfs, home to the first university, which allowed women to study there and pursue careers in the Renaissance) and it remains a college town to this day. Bologna was kind of an unplanned visit, so we mostly just wandered around aimlessly, enjoying the gorgeous architecture, then took a wonderful, vigorous walk up to the San Luca Sanctuary. Word is that you can see the Apennines from that vantage point high above the city, but there was fog of old testament proportions on this day and we couldn't see more than four feet in front of our faces, so I'll have to trust that the Apennines were, in fact, where they are supposed to be. It's around two miles up to the church, mostly a pretty steep incline throughout. It was misty and rainy all morning. Hardly ideal conditions for a walk, but one of the amazing things about Bologna is that there are miles and miles of sidewalks (paved with either huge paving stones or marble) covered with porticos or colonnades -- glorious, arched porticos, stretching miles in every direction all over the city. In sum, if you want to take a long walk in the rain, Bologna is the place to do it. Also, and perhaps most importantly for my purposes here, Bologna is an eater's paradise. 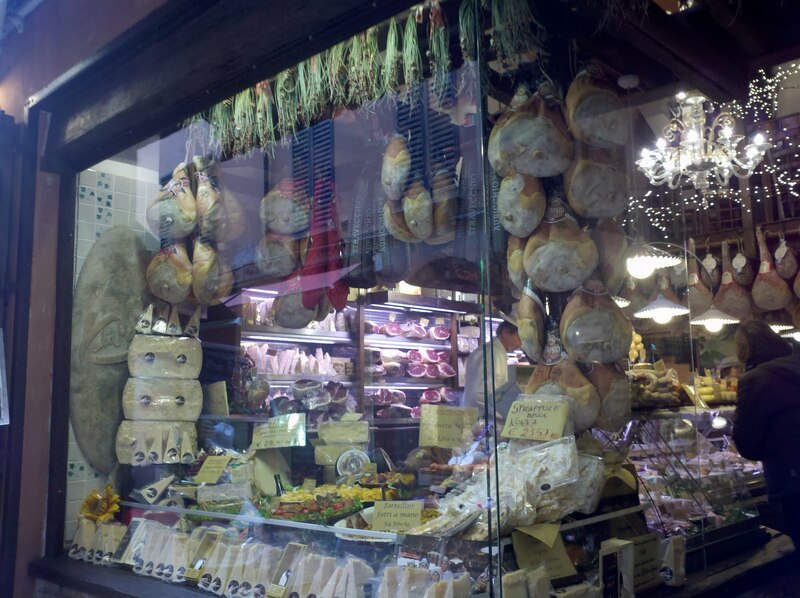 There are cheese and ham shops on top of produce markets, and more cheese shops, and pastry shops and gelato shops, and more fruit stands, and pasta shops, more cheese shops, and more cafes. I could get seriously fat in Bologna. If I lived there (and I'd consider it), I'd need to climb that hill to San Luca three times daily. At least. In a food processor, puree onion, carrots, shallots and garlic into a coarse paste. Really run these through because you don't want any big chunks -- the vegetables flavor the sauce, but you don't want to be biting into them. Heat a large, deep sautee pan over medium heat and coat with olive oil. Add the pureed veggies; season liberally with kosher salt. Cook on medium or medium-high heat until all the moisture has evaporated and the veggies turn nice and brown. It takes about 20 minutes and you have to stir frequently. This is a key step. Don't try to hurry through it. Let the veg cook. Don't worry if they stick to the pan a little. Add the ground beef and season again with salt (you want to layer the seasoning throughout.) The beef will release a lot of moisture and you can use this to really scrape up any brown bits from the veg, then proceed to really brown the beef -- about another 20 minutes or so. Add the tomato paste. Again, brown this - you can brown tomato paste. I usually let it brown for about 10 minutes. Add the red wine. At this point, you can really deglaze the pan from any sticking, browned bits of beef or veg that have accumulated along your way. A word about the wine. Some people say you shouldn't use wine to cook that you wouldn't drink. Fiddlesticks. First off, if you have really expensive taste in wine, that's just an untenable way to run a kitchen. Moreover, you can get a perfectly good wine for cooking purposes for under $10 (often under $8, depending on what's on special). Beyond which, I often cook with chardonnays and I wouldn't drink one of those with a gun to my head. Just saying. As to this wine, the wine most often served as the house wine in Bologna trattorias is a valpolicella, so I prefer to use a valpolicella to cook a bolognese sauce; but really, any hearty red will do. Reduce the wine by half, about 5 minutes or so. Add the bay leaves, crushed red pepper, and the thyme, plus a couple of cups of water to the pan (just covering the meat by 1/2 inch to an inch.) Bring to a boil, then reduce to simmer. Then break out a book or the paper, but give the sauce an occasional stir. It will cook down and then you add more water - about two cups. You repeat that process a ton - adding water and letting it cook down. But this is where the flavor really explodes and you keep doing this for about four hours - adding water, stirring, reducing, then adding more water and on and on. And yes, you did read that correctly -- you do this for about four hours. Remember I said time was the most important ingredient? As you do this, give it a taste to see if you need more salt (or anything else.) At this point, after four or five hours, the meat in the sauce should be like silk. Remove the bay leaves and the thyme (if you used a bundle). Take about half the sauce out and put it in another bowl or another saucepot. In Bologna, this sauce is often paired with fresh, hand-cut tagliatelle, but you needn't roll out your own pasta to enjoy it. I like it with dried pasta and generally use a thicker cut of spaghetti (i.e., not an angel hair), cooked al dente, of course. When the pasta is just near al dente, finish it in the sauce pot with the bolognese sauce. You can use the extra sauce on your pasta, should you need it. Or, you have a second batch on hand for another night. I serve it with pecorino romano, but you can use parmigiano-reggiano if you prefer that flavor. Mangia.